There’s nothing like looking at christmas lights to get you into the holiday spirit. And here in North Texas, there are several spectacular displays to visit. So grab yourself a peppermint mocha, some hot chocolate for the kiddos and load up the car for a dazzling experience! This drive through display features over a million lights and 100 displays; after the show visit Santa’s Village for photos with Santa and more! Now this may not be a drive through light display, although the hotel has over 2 million lights displayed, but is a must-see! This walk-through holiday attraction features 2 million pounds of hand-carved ice sculptures and is kept at a chilling 9 degrees(they provide heavy parkas). They offer ice slides, snow tubing and even an Ice Bar for adults. This display started out as a friendly competition between neighbors for cash prizes, but they have continued the tradition and now feature charitable causes, like the Children’s Medical Center this year. You can find a recommended driving route on the HOA Page and book a carriage ride through DFW Carriages. The huge homes are beautiful and so are the christmas decorations that are professionally displayed each year. The star of the show is the 140 year-old pecan tree that takes 4 men about a week to decorate with 5,000 lights. You can also book a carriage ride through DFW Carriagesfor this neighborhood. 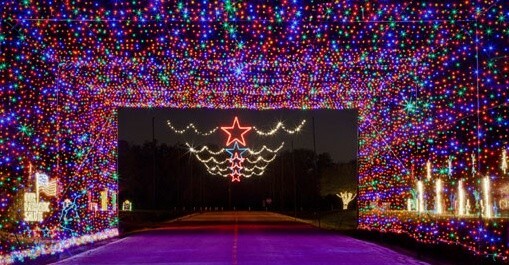 Voted as one of Texas’ best light displays, this year marks the 41st anniversary of the lights. Over 200 homeowners come together to make this display truly memorable. Follow the candy cane signs through one of North Texas’ longest animated shows. Featuring over 500,000 lights, the drive ends with Santa Claus himself. Tune in to 107.3 FM during the show for the full experience. Best Wishes to you and your family for a Wonderful Holiday Season and a Happy New Year!